There have been growing concerns within Australia and overseas about the way in which economic globalisation and developments in technology are disrupting the economy and society—for both better and worse—often in unpredictable ways. Within this context, higher education is experiencing significant and rapid changes, the outcomes of which are equally uncertain. This has raised major challenges in public policy: the role of education and training in a world where the nature of work and skills are changing; the shift of education to a continuous process of lifelong learning rather than focusing on careers that may be obsolete within a decade; whether current educational institutions are capable of adapting to the changes required; the public versus the private costs and benefits of education; and the changing role and character of equity in higher education. While equity in higher education has seen unprecedented advances over the last decade, there is now less certainty as to whether past trends are any guide to future directions. In recent years, a number of reports have examined the strategic challenges facing the higher education sector. Some have focused on equity, others have incorporated it to a lesser degree. The reports differ in the scope of their focus and preferred solutions to challenges. As change in higher education unfolds rapidly, we need to ensure that equity issues are understood, communicated and incorporated into change processes. A synthesis of the drivers of change in equity in higher education based on high-level findings from the reports. Summaries of 14 reports with a focus on key trends, facts, ideas and recommendations. A synthesis of the ways in which higher education may need to evolve to accommodate and resolve the sometimes conflicting pressures for change. 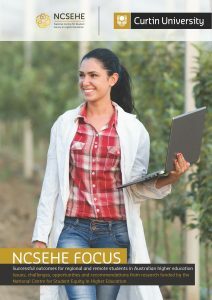 This publication complements the NCSEHE “Student Equity 2030” project — an ongoing process of discussing the future of equity in higher education. 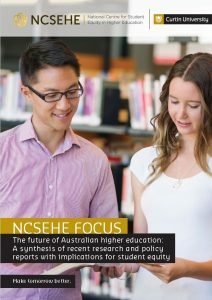 “If the starting point for articulating a contemporary vision for Student Equity in Australian higher education is a Fair Chance for All—and why would it be otherwise?—the context within which we prosecute this national conversation for change is everything. 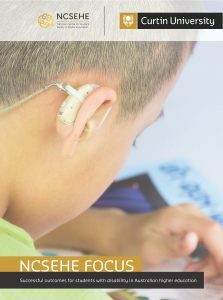 From amongst an overwhelming number of recent reports and policy offerings, this timely contribution by the NCSEHE distils critical equity learnings from a carefully selected number of key sources. This succinct synthesis of combined sector wisdom serves to remind us, all over again, of the moral urgency and socioeconomic imperative to ensure that no individual, community or region is left behind or further marginalised by intergenerational disadvantage or entrenched educational inequality. As all industries, disciplines, countries and economies are challenged by job obsolescence and the re-skilling demands of the Fourth Industrial Revolution, Australian higher education has a singular opportunity to re-calibrate its meaningful engagement with the Australian public and provide clarity and leadership on educational equity for all Australians.